Days of Our Lives (DOOL) spoilers tease that a wedding ceremony is coming for Sonny (Freddie Smith) and smarmy Leo (Greg Rikaart). Leo is hell-bent on getting Sonny to marry him, or else he’ll go to the press and tell all about how Sonny “killed” him and covered up the crime with Will (Chandler Massey). The scandal would put “WilSon” in a world of legal trouble, and it would cause Titan to take a major financial hit. So, Will and Sonny will decide that Sonny should go forward with the wedding to Leo. It obviously won’t be what either of them want, but they’ll feel that they have no choice. 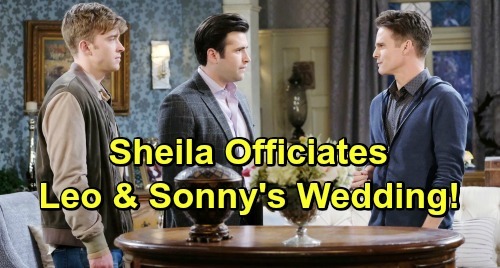 Sonny will reluctantly plan the wedding, wishing that there was some way out of the whole mess. Of course, they’ll need someone to officiate. Justin (Wally Kurth) will probably refuse to do it since the wedding involves Leo, or else Sonny just won’t be able to bring himself to ask his dad to do it. It looks like Abe (James Reynolds) will be out of the running, too, but apparently there will be one individual who will be available…Sheila (Tionne Watkins). Who knew Sheila could officiate weddings? Well, apparently she can, and she’ll agree to marry Sonny and Leo. Exactly where the ceremony takes place remains to be seen, but it won’t be a happy occasion (for anyone except Leo) and, as you can imagine, it won’t go smoothly. According to Days spoilers, the ceremony will be interrupted by something or someone. Will someone object to the union during the “does anyone have any reason why these two shouldn’t be wed” portion of the ceremony? Perhaps Will is going to object. Or maybe there will be another interruption. Leo’s mother is supposed to arrive on the scene sometime soon. Could she be the interruption? Whatever happens, it sounds like this will be a ceremony to remember. Do you think Sonny and Leo will actually get married? 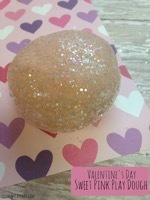 Stay tuned to DOOL and don’t forget to check CDL often for the latest Days of Our Lives spoilers, updates, and news.